Welcome to this amazing collection of 100 brand new mental maths puzzles. 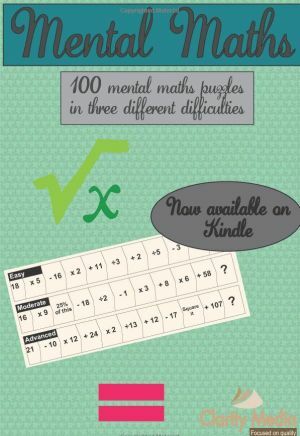 The mental maths puzzles come in three different difficulties, easy, moderate and hard. As you work through the three, the sums will in general get more difficult. The aim of the game is to get better over time. So record how long it takes you to do each puzzle, and over time as you work through the 100 puzzles, you should notice that your times start to come down. For instance, if you took a minute to solve the first few easy sums, by the end of the book you should be down to 30 seconds. 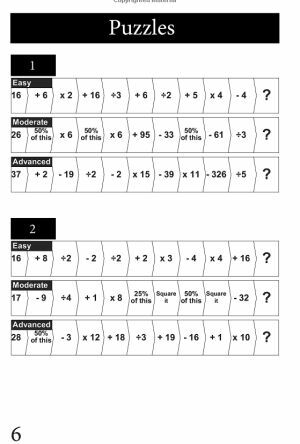 These brain training mental arithmetic puzzles are often used as practice puzzles in schools and are regularly seen in newspapers too. They are great as they require a range of different skills to solve them. Whilst easy puzzles stick to the four basic operations in maths: addition, subtraction, division and multiplication, medium and hard puzzles include other concepts: such as square roots, the square of a number and even percentages. For those who aren't familiar with these or find percentages hard, then these puzzles make great practice material. Although some of the sums may appear difficult, every puzzle is carefully chosen to ensure that they are all perfectly solvable by the human mind: there are no impossible sums. Great care has also been taken in the mental arithmetic required at each stage of the sums to ensure that you never have a non-integer answer: so if you ever get a number like 9.5 as an answer instead of 9 or 10 then you can be sure that you have done wrong somewhere: we make sure every sum you are asked to perform is fair, even if we occasionally do throw in things like asking you to work out 34% of a number!